Jimmy Kimmel is speaking out about politicians afraid to do anything when it comes to preventing gun violence. Kimmel took time out from his usual Friday night monologue to address the tragic school shooting in Santa Fe, Texas that left 10 people dead and 10 wounded. “We had another school shooting today, this time in Santa Fe, Texas. 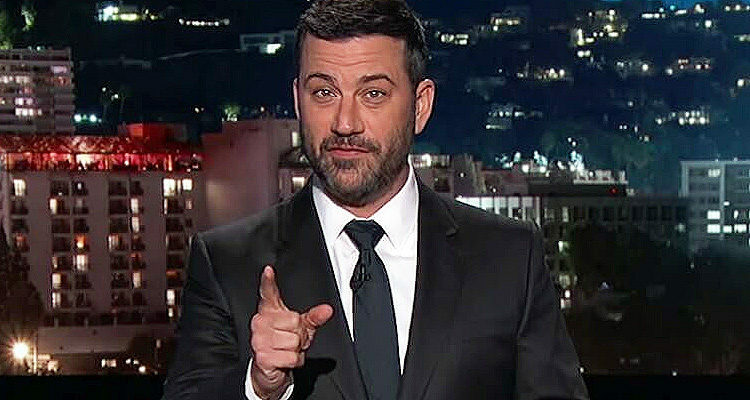 At least ten people were killed, ten are wounded, mostly high school kids,” Kimmel began before ripping into do-nothing politicians. Once again our leaders are sending their thoughts and prayers. President Trump said he is “with the people of Santa Fe in this tragic hour and will be with them forever” except for when it comes time to doing something, then he will not. Neither will any of the Governors or members of Congress who don’t ever do anything because they are fearful that it will hurt them politically. They know the truth. They know this has gone too far, but they’re too cowardly to do the right thing. They care more about the support of the NRA than they do about children. So they sit there with their hands in their pockets that are full of gun money and do nothing, they just wait for the outrage to pass because it didn’t happen to their children. There’s only one way to look at this: How would you feel and what would you do if these were your children who were killed today? The truth about our democracy is that the people don’t make the laws, we vote for those who do. So the least you can do is to register to vote, right now. The only way we can make any meaningful impact on this epidemic is to make sure we vote for the politicians who will do something. Our leaders right now seem to think everything is fine. It isn’t fine. This kind of thing does not happen in countries that have real, sensible gun laws. I don’t know about you, but I – for one – am very very tired of this. The show then broke to a video montage of upset children describe the tragic events of today with politicians like Trump, Republican Sen. Ted Cruz of Texas and other Republican leaders vowing to protect the Second Amendment. “You can keep your guns,” Trump says at a campaign rally. “We will filibuster any legislation that undermines the Second Amendment,” ranted a flamboyant Ted Cruz. “Of course we want to listen to these kids,” stated Republican House Speaker Paul Ryan. “In this administration the right of the people to keep and bear arms will not be infringed,” stated Mike Pence. “And then you have the gun grabbers who come after our guns and what I say is come and take them,” shouted Ted Cruz. For more information about how to make change go to http://www.everytown.org and lets do something about this already.